Synopsis: As the new prodigy at San Fransokyo Institute of Technology, Hiro now faces daunting academic challenges and the social trials of being the little man on campus. Off campus, the stakes are raised for the high-tech heroes as they must protect their city from an array of scientifically enhanced villains. Hiro tries to connect with a new classmate. Go Go and Fred delve into comic book mythology to defeat High Voltage. Go Go and Honey Lemon clash as they become roommates. Honey Lemon's chem-lab purse is stolen. When super-villain Baron von Steamer crashes Fred's Bro-Tillion, the Big Hero 6 team springs into action. Aunt Cass becomes obsessed with participating in an underground cooking competition. 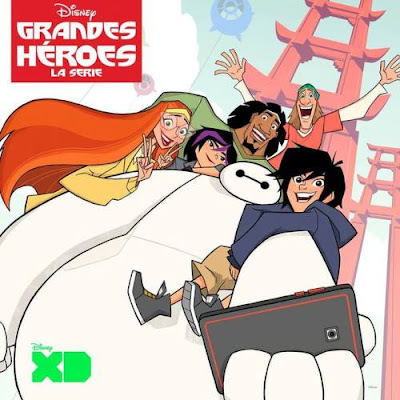 Baymax, Fred and Hiro follow Go Go into the mysterious Muirahara Woods where they promptly get lost because their electronics, including Baymax, fail. After his latest school project fails spectacularly, Hiro is demoralized. The team must defeat the incompetent villain, Globby. After Aunt Cass nearly figures out Hiro's secret life as a member of Big Hero 6, Hiro plays matchmaker to find Aunt Cass a boyfriend to distract her. When Hiro is sick, he is unwilling to follow advice and let the team handle the Mad Jacks. Hiro wants to attend a science workshop hosted by SFIT's most famous alumni, Dr. Trevor Trengrove, but is deemed to be too young to go. These are Google drive links. You can do both, watch or download. After reaching the destination page i.e. Google drive page, wait for the processing of video. After the completion of process you can watch the video and it will also be saved in your Google Drive storage. Not aired yet on TV. no google drive link is there?